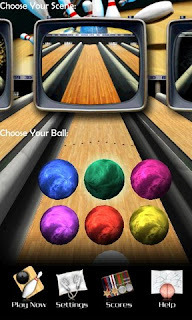 3D Bowling is the most realistic and exciting game to play on Android mobile phones. Its the leading 3D bowling game now stunning effects. Latest version 1.2 has added a new feature called App2SD function for android 2.1 and higher versions. Drag the ball to specific position i.e., right or left to throw. Flick the ball with your finger to bowl. 3D Physics Engine for Real-Time Action. Download 3D Bowling game at Appbrain.com.